Pies and tarts always scare me. It’s never about the filling, it’s just the crust itself. The rolling part of the dough just terrifies me somehow, as I’ve read reviews that over-rolling the dough will result in a tough pie/tart. I can’t imagine spending loads of time making the crust and ended up having a horrible pie/tart to taste. So I thought I’d play cheat for this time and maybe a few times later I’m confident enough to roll the dough. How did I play cheat, you ask? Well, I used Betty Crocker’s Pie Crust Mix. Simply mix cold water into the mix and you get the crust and there is no need for refrigeration thus it can be rolled immediately. The video podcasts on Epicurious gave me a hell good confident boost. The conclusion? I guess pie-making isn’t that difficult afterall. But I know I still have tons of practice ahead to perfect my crimping and fluting skills. The edges don’t look… that gorgeous, if you ask me. As for the filling, it is idiot-proof. There’s no cooking involved, just tossing and then in they go into the crust. One mistake I made though is to forget to sprinkle with lemon juice and top with butter. My excitement to make the pie crust was too overwhelming that I forgot about that step. Well I did try to salvage a little by slotting a little lemon juice and butter here and there through the openings (or cuttings) in the top crust. I was actually very worried that it’ll affect the overall taste but thankfully it still tasted alright in the end. During the baking, the blueberry juices did bubbled over but it was actually a pretty lovely sight to see it bubbling inside the tart (I was REALLY excited). The crust is flaky and the filling is sweet and sour all at the same time. I tried both at room temperature and when it’s cold. Both tastes great. 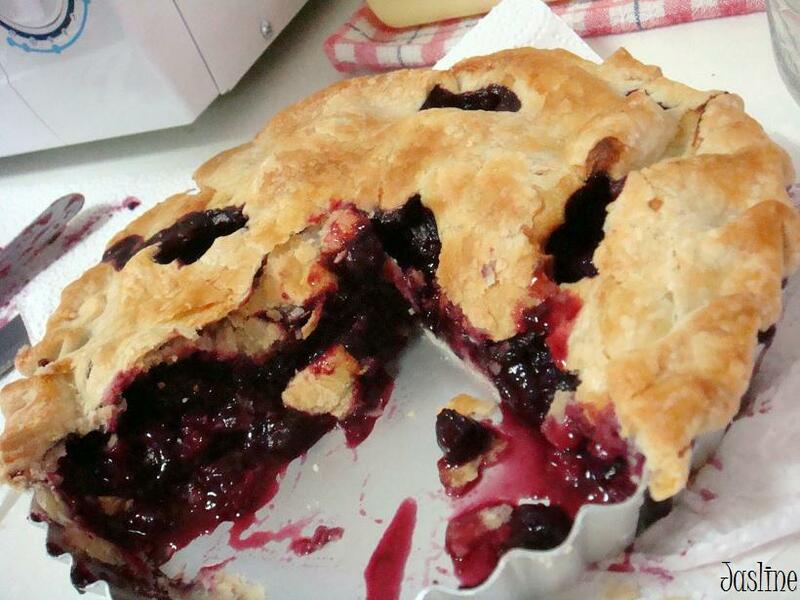 I did made a little mess in the kitchen due to my un-professional pie-cutting skills. Anyone has a good tip about neat cuts for pies? Roll out the pastry for the bottom crust and line into a 9-inch pie dish, pressing gently into place, taking care not to make any fingernail dents. Brush with egg white to prevent the crust from becoming soggy and set aside. Process white sugar till powder-like, then stir together with flour and cinnamon in a large bowl. Add the blueberries and toss them together. Transfer them into the pie dish. Sprinkle with lemon juice and dot with butter. Cover mixture with the top crust and seal the edges by pressing gently around the rim, trim the excess dough, and flute it as desired. Make four vents in the top with a knife. 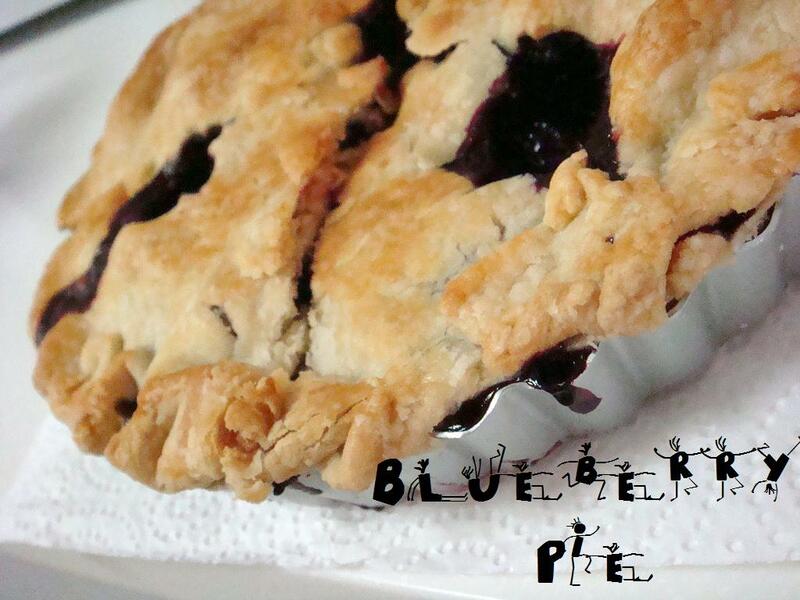 Place the pie on a cookie sheet to catch any drips. Bake the pie for 1 hour till the crust is golden and the filling bubbly. Remove the pan to a wire rack and cool the pie completely before serving it. The pie will be too runny if it is sliced hot. Verdict? 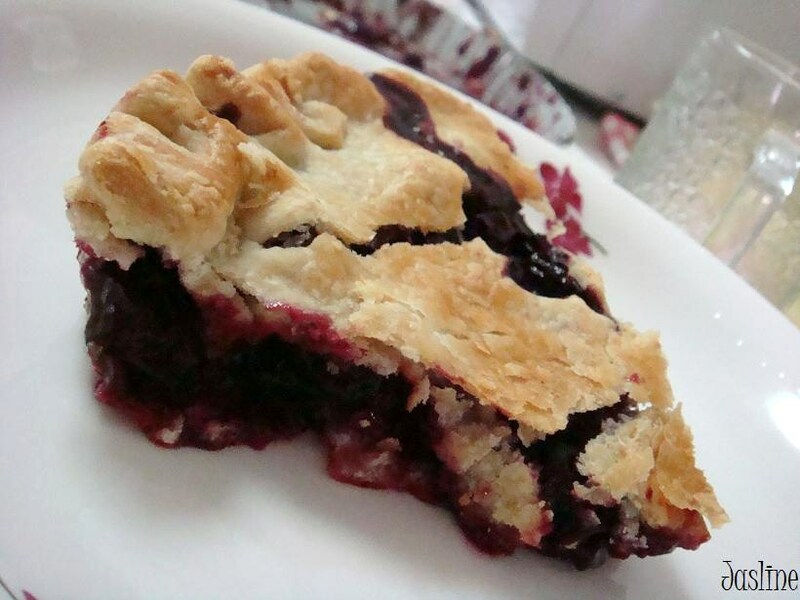 I’m so going to make this pie again and I’m going to try new pie and tarts soon.